Pat your potatoes dry one more time and toss them into the skillet. Stir to coat with butter and olive oil, then liberally sprinkle on the spice(s) of your choice — I used Miracle Blend last night, but it’s also great with Lawry’s or dry ranch seasoning or…? Make it your own! If you don’t have a cast iron pan (go get one! They’re cheap!) 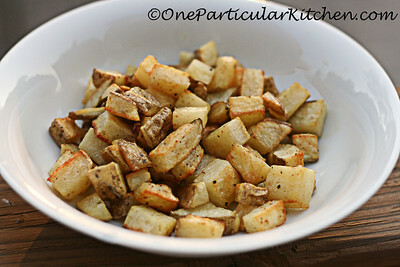 you can mix the potatoes, butter, olive oil and spices in a bowl, then roast on a cookie sheet. Couldn’t be easier! I guess I need a cast iron pan, because these look great! This would be so delicious for breakfast. With a fried egg. Maybe some bacon or ham…maybe I could use bacon fat in place of the butter and oil! Mmmm….so making this! What a great tip about using the hot water first! I had never heard that. I will do this from now on. Thanks! Ok. I think this is on “my list” for two weeks from now. My muffin tins have quite a bit of rust on the bottom after being in a box for twelve years (I never used them after Ian died). The top part looks okay, though. Wish me luck scrubbing them down! Cast iron MUFFIN PANS?!? I’m dying of lust over here. Will you send me a pic?? I wanna see! Yes, you can definitely do steak in cast iron — it’s really easy stuff to work with once you figure out the method. I did my steak today – it was EASY! The only problem is that I cooked it 4min like he said on the show, and that was just too rare for me. Mostly my oven, I think – it was NOT medium rare. More like still moo-ing. 🙂 But now I will know how long for next time. Right now I have cut up sweet potatoes and some cut up fennel in the pan in the oven, roughly following this recipe (I didn’t feel like going to the store for any other potatoes and I was too lazy to fix the fennel in a different pan, but I wanted to use the rest of it because I used about a third of a bulb for juice the other day and wanted to cook the rest), so we’ll see how that comes out! I tried this recipe, following the instructions carefully. The potatoes turned out great. We used barbecue spices and my family loved them! Agree a cast iron skillet is the key. This recipe is a great crowd pleaser when you have company over. What does a pat of butter mean? went to a local farm and picked little potatoes right out of the earth.. going to make your recipe tonight! thanks.. I have a well seasoned cast iron pan too! cant wait! Tried the potatoes last night with my own twist. I started the potatoes with the hot water. I patted them dry. I didn’t have olive oil, so I used veg. oil. I put in heavy pan on high and the potatoes got browned. I then put them in the oven which dried them and made them really crisp. Here is a tip about removing rust from your cast-iron pans. Scrubbing cleansers made with chlorine bleach do not work on rust. Cleansers made with oxalic acid do remove rust but they can be a little hard to find. (Many plants, including rhubarb, contain oxalic acid.) Some of these cleansers are: Zud, Bon Ami, and Bartender’s Friend. I have heard that plain yoghurt works but I have never tried it myself. Good luck. Using a cast-iron pan is a good way to increase your dietary iron intake especially if you cook an acidic food such as tomato sauce. If you have a sandblasting company in the area they will clean your pan quite cheap. You will have to season the pan again when you get it back though. I clean mine in this manner every 6 months. Do you put the cast iron into the oven? Made these tonight and they were delicious. I used Montreal Steak seasoning, and it added just the right touch. Thanks the tip about the hot water – I’ll be making these more often.